Every summer, OCEF volunteers and donors from all over the world spend their vacation time to visit OCEF-sponsored schools or to help in teaching, in the process gaining first-hand experiences in the mission and functions of OCEF. In this issue of the newsflash, we would like to share the stories and reflections of two volunteers on such visits. By Huang Xiaofan, volunteer from U.S.A. 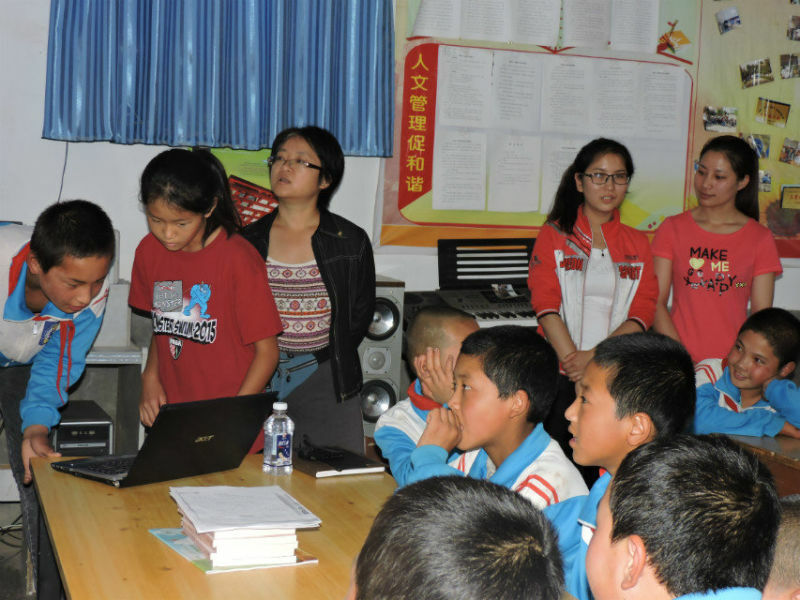 In June, I took my kids, Hai and Wan, who are both in junior high, and visited a few schools in Pingliang, Gansu, to see how our sponsorship in the Book program and English Corner on the Internet program is impacting the students’ lives. The first school we visited was Zijincheng Elementary. It is located in an area that was once rural but now looks urban. However, like many other schools in similar settings, Zijincheng still lags behind the traditionally urban schools in the same city. OCEF provided 657 books in April to the school, partially due to the efforts on its passionate and dedicated librarian, Ms. Ren. On this visit, we spoke to Principal Zhang and found out that the class schedule is almost filled to the maximum and all students are required to go home during the noon break because of safety requirements. As a result, currently there is no time slot for the library to be open to the students, and the school still needs to figure out a way to do that. I sat in a class taught by Mr. Ma, winner of a teaching award from the City, who reads books about teaching techniques from experienced teachers and writes down his own reflections every day. The class I sat in was on “Colorful Africa,” and I was surprised to see that there was little old-fashioned lecturing, as most of the content was delivered through an interactive process of Q&A, with a final review by the teacher. All students were very engaged throughout the session. Afterwards my son Hai told Mr. Ma that it was wonderfully done, skin to the way similar classes are run in the U.S. In the end, Principal Zhang asked me to teach a class for the students and gathered about 300 students from the fourth, fifth, and sixth grades in a multimedia meeting room. I started with a story about an African kid. A dropout from school, he loved reading and experimenting, and managed to build a wind turbine by himself to generate power for his fellow villagers. I hoped to demonstrate to the students that the power of knowledge reaches far beyond the college entrance exams. Then I asked my daughter Wan to read Cat in the Hat for the students, who were so absorbed in it that some of them stepped up to read part of the book to the others. Later on, some of the kids wrote me to say: “That was the first time that I felt learning English was useful.” The English teachers at Zijincheng told me that they were so hard-pressed to complete the regular curriculum that there was no room left in their classes for extra materials to stimulate the students’ interest in the subject. In later visits to other schools, it became increasingly clear to me that a large part of the difficulty with teaching English at rural schools lay in lack of course materials that the students would find interesting. 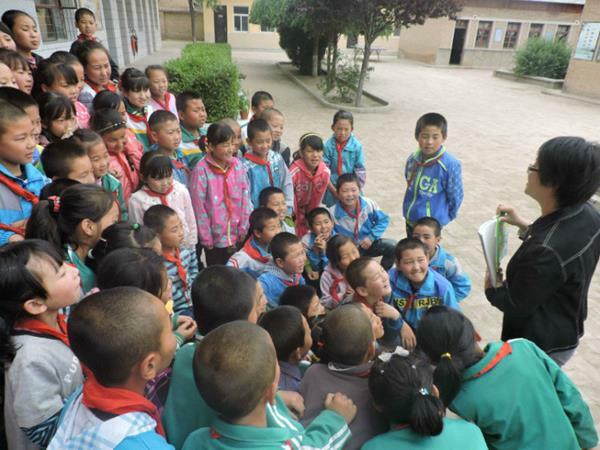 During our trip to Pingliang, we visited two schools each day, and everywhere we went, we would share some time with the kids over picture books in English. One day we were at a fourth grade English class at Shuiqiaogou Elementary, and the illustrated books I had with me were somewhat beyond their level. Wan took the lead to read their textbook, which happened to be about making purchases in a store. It occurred to me suddenly that I could teach them how to make a sale in English, since some of their families probably ran small businesses. “A lot,” came the answer. All the students looked puzzled. At that, the students became noticeably excited and engaged. Immediately they started going through their textbooks and looking for the words: tomato, skirt, bike, apple, desk, book, robot… They were so focused on the task that they did not even feel shy in giving out answers in the best English pronunciation they could muster. We went on to discuss the prices of the various items and reviewed all of the numbers from 1 to 99. One student happened to have brought some fake money and we practiced selling and buying. I only wished we had more time to go further in this exercise. There Is a Lot Overseas Donors Can Do while Visiting! If there is a library on site, ask the school for an opportunity to read to the students and encourage them to read more. If you or your companies speak fluent English, take some illustrated books with you and read them to the students. They need opportunities like this to appreciate what they have learned in their English classes. If you love your profession, talk to the students about what you do and show them what future they may have. There is very little opportunity for rural kids in China to access professional and vocational education. If your English-speaking kids are looking forward to conversions with the students, prepare some topics beforehand. While my kids tried to engage in conversation, the students could only come up with questions like “what’s your name” and “how old are you,” although even such simple topics also inspired them to practice their English. If you have a background in education, talk to the teachers and administrators about building libraries and teaching methodologies. Please contact 该E-mail地址已受到防止垃圾邮件机器人的保护，您必须启用浏览器的Java Script才能看到。 and make your visits more meaningful! The 2015 OCEF Summer Teaching Camp was offered at Chaimen Middle School and Touzhai Middle School in Huining County, Gansu Province. Most volunteers at the camp this summer had overseas education, including working professionals as well as students. The Camp was officially opened on July 20. The students came very early for enrollment, and we prepared great ice-breaking games for them to get to know one another. They were encouraged to design creative name cards, and were then divided into three classes, A, B and C. After a full day’s activity, everybody was excited and burned out at the same time, but all fatigue was wiped away when a double rainbow appeared in the sky after a storm. In the following weeks, we offered three classes in the morning and two in the afternoon. In reading classes, students were assigned to different groups to adapt the story of the crow and the fox into a play, in an exercise of both creativity and teamwork. In art classes, the teacher asked the students to draw themselves and their future, and the students’ rich imagination gained admiration from the teacher. Computer classes were very popular among the students. While some of them knew how to use computers to play games or watch videos, the majority of them had very little general knowledge about computers. The teacher started with entry-level contents, developed students’ typing skills through games, and taught them some basic search functions. The math teacher launched the classes with interesting card games to initiate discussions on math problems that students had never encountered in classrooms. The music teacher introduced different genre of music to help them develop music appreciation, and even danced with them in a ballet segment from Swan Lake. Naturally, PE was also popular. The teachers and students mingled together and really got to know each other. The teachers introduced a new sport this year—baseball, which proved to be highly intriguing and engaging to the students. Since the volunteers came from many different countries and regions, we arranged a World Culture class to expand the students’ horizon. Every night the volunteers would get together to reflect on the events during the day, and to review what had gone well and what needed to be improved. The overall curriculum remained the same as in the first week, but the students started to prepare for their performances at the closing ceremony. Even though many students were shy, they were very active in volunteering for the event. Each class came up with at least five items for the program, including a dance called Arabian Night and the play Cinderella. On Friday, the whole camp went into frenzy with a baseball tournament. Each of the three classes had its own team in the tournament, and the volunteers contributed a fourth team. After some grueling sessions, Class C came out to claim to championship. In the final game, Class A led most of the way, but Class C completed a comeback though last-minute scoring and won the game by one point. The students from Class A were so disappointed that they burst into tears and were not even in the mode for the final photo shot. But that is what sports are really all about: There will always be winning and losing, despite the best effort. As long as you learn from your mistakes, failure will be the mother of progress. The second week of the camp was full of happiness and passion, with sweat and tears merging together to paint a colorful picture. I hope it will remain in everyone’s memory forever.